I am normally a fairly easy-going person; it usually takes a lot to set me off. But every once in awhile something does, and an article I read today managed to do it. But first I wanted to start with a good news story–an old house story with a happy ending. 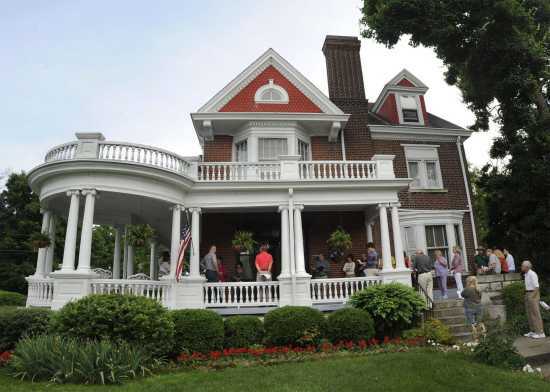 I came across an article in the Southeast Missourian about a family who fell in love with an old house in the historic town of Cape Girardeau, Missouri. Cape Girardeau is over 200 years old and is located on the Mississippi River. The house was built in 1898, but the land can be traced to when it was originally purchased from the Spanish government. The house was built for Mr. Harrison, the postmaster of the town in 1898, and the Harrison family lived in the home until 1986. The old house didn’t have any major structural issues when it was purchased in 2003 by Robert and Kaye Hamblin, but it needed quite a bit of cosmetic work. They decided to do a period restoration, and the only modern part of the home is the kitchen. They tried to stay true to the old house’s past in all the other areas of the home. As you can see from the picture, they did a great job of restoration on the beautiful old house, and it was featured during National Preservation Month activities. I mentioned in a post last week that there is a movement in Congress to possibly extend the June 30 deadline for the First Time Home Buyers Tax Credit. The extension would benefit only those who already have a sales agreement on a home, but who are having difficulty meeting the deadline for closing on the sale due to the lengthy time it’s taking for appraisals and loan approvals. The National Association of Realtors fear that as many as 180,000 sales are in danger of missing the deadline for closing. The addendum for the extension was attached to another bill–one which failed to pass for the third time today–and now may be shelved altogether. How could this extension possibly not be passed? The tax credit for these buyers was already approved, and they have done everything they were required to do to qualify for the tax credit. The only reason they won’t be able to close now is that the paperwork won’t be complete by June 30, through no fault of their own. You would think that with new home sales dropping off by 33 percent last month, Congress would be doing everything possible to allow these sales to happen.